I enjoy finding ways to simplify life. With the Holiday season rapidly approaching, I’ve made it a goal to enjoy the Holidays by making my home a stress-free environment. Want to know how I plan to do this? Learn how to better focus on the importance of Thanksgiving with these 5 tips for a stress-free Thanksgiving. 1. Delegate: The first step when simplifying any situation is to delegate. If someone offers to help, accept their offer. Assign various Thanksgiving side dishes among family members. Delegate a decorating crew, cleanup crew, anything you can! Don’t forget to involve the kids too! 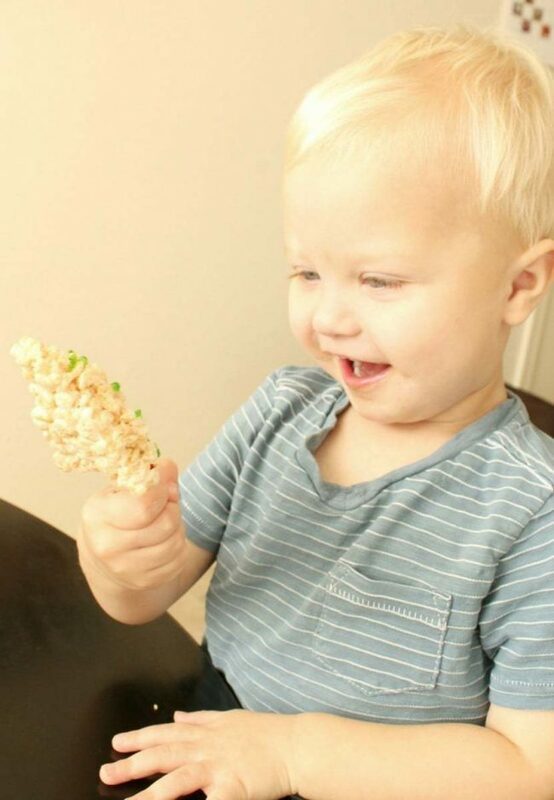 Assign age appropriate tasks – making place cards, greeting guests, helping cook, etc. 2. Make Lists: A week or two before Thanksgiving, start making a “to-do” list. Categorize tasks in order of importance and when they need to be completed. Trust me, nothing feels better than checking an item off of your “to-do” list. Also, start making your menu plan early. Try spreading out your Thanksgiving shopping over a few weeks. The more you plan, the less you have to worry. 3. Prepare the day before: In order to enjoy Thanksgiving day, prepare as much as you can the day before. Cook all items that can be refrigerated or left out at room temperature. If possible, set the table, and put up your decorations. As I mentioned earlier, I’m all about keeping things simple. That’s why I love the idea of using table centerpieces that are both fashionable and functional. One of my favorites includes filling candle holders with treats – your guests will love that! 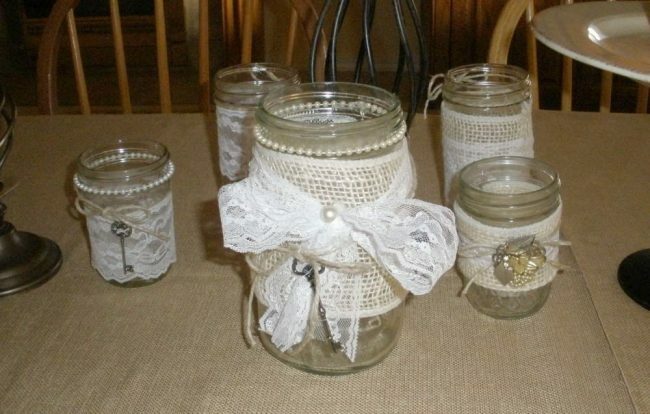 Another fun option is to decorate mason jars and place candles inside. Just remember, whatever you do, prepare ahead of time. 4. Clean as you cook: In order to avoid a massive post-Thanksgiving clean up, clean as you cook. 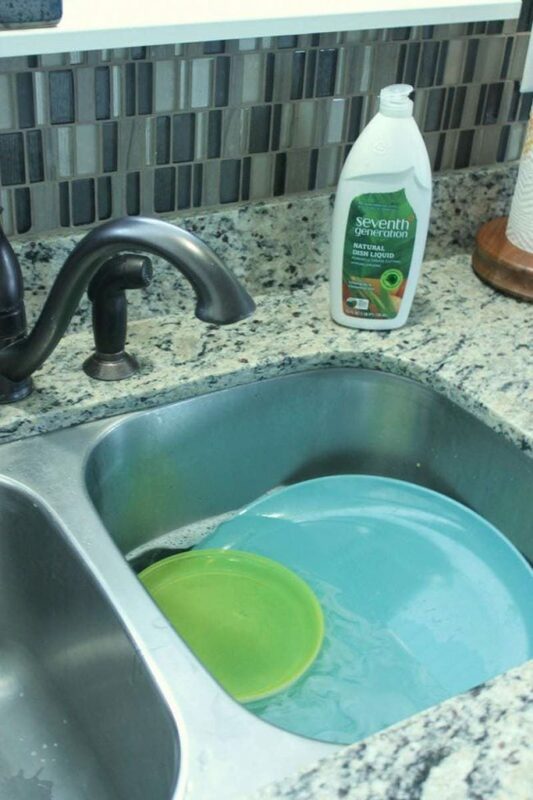 Keep the sink full of sudsy water and wash your dishes as you go. It really helps speed the process to use a quality dish liquid that quickly and effectively removes the grease and grime. That’s why I love Seventh Generation’s Liquid Dish Soap. It’s natural formula is gentle on my hands, smells amazing, and makes my Thanksgiving clean-up a breeze. 5. Prepare for company beforehand: If you have company coming for Thanksgiving, don’t wait until the last minute to prepare your home. A few weeks beforehand, wash all of your bed linens, and make your home company ready. If you want to really impress your guests, using Seventh Generation’s Free & Clear Laundry Detergent will leave their sheets soft, clean, and smelling heavenly. 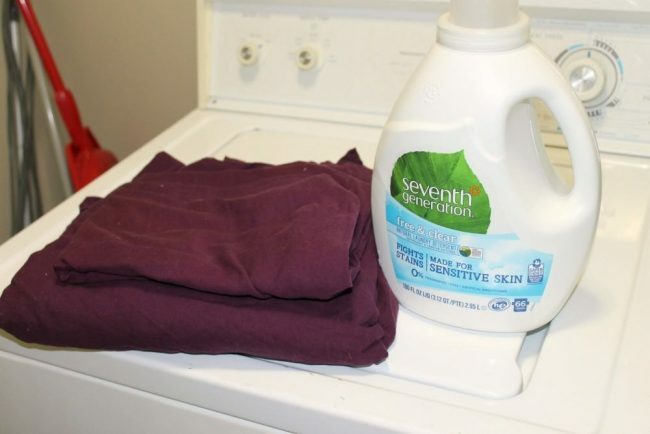 Not to mention, Seventh Generation’s Free & Clear (as well as other product in the Free & Clear category) is the only detergent on the market that does not include artificial or optical dyes. This means that no residue is left behind that could potentially transfer to your skin; making Seventh Generation a trusted brand for your entire family. Just remember, the more you prepare ahead of time, the more you will be able to enjoy your Thanksgiving. Be sure to visit Seventh Generation for other all-natural household products to help get your home ready for the Holiday season. 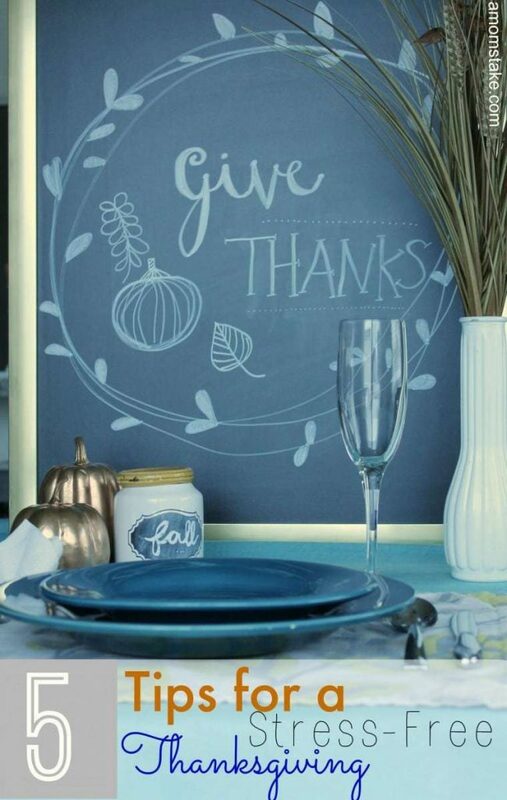 How do you plan to simplify your Thanksgiving? 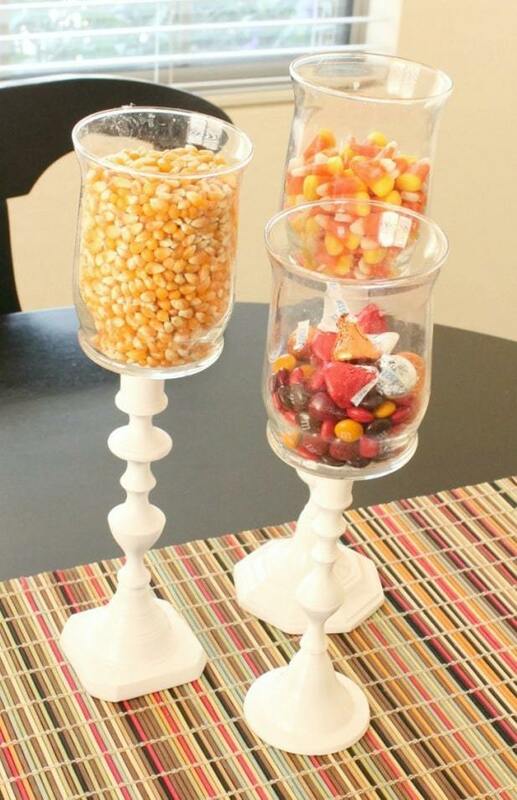 I love those candy corn vases. They are a beautiful touch to any table. I like to prepare as much the day before as possible. I too wash my dishes as I go. I am so bad at accepting help. My family offers all the time, but I have this issue with too many hens in the kitchen. HA! Then I get really stressed. I need to just give in and delegate 🙂 Thanks for your tips. Cleaning as you go is huge on Thanksgiving! I don’t even think I own enough dishes to get through all the prep without cleaning! Doing most of the prep work the day before can really cut down on the stress of Thanksgiving day! It really gives you time to enjoy your friends and family instead of stressing out over the meal! Great tips for surviving Thanksgiving. I especially agree that planning and doing as much as you can the day before is key to actually enjoying the holiday rather than feeling overwhelmed and exhausted. I love your clean as you cook tip. Its definitely what saves me when I make a big meal! I’m hoping to make my Thanksgiving stress-free this year. I need to do some early prep for sure. I do as much prep as i can before the holidays. I cook what i can the night before so that i can enjoy more time with the family. A stress free thanksgiving is the best kind! Great tips. Thank you! These are great tips. 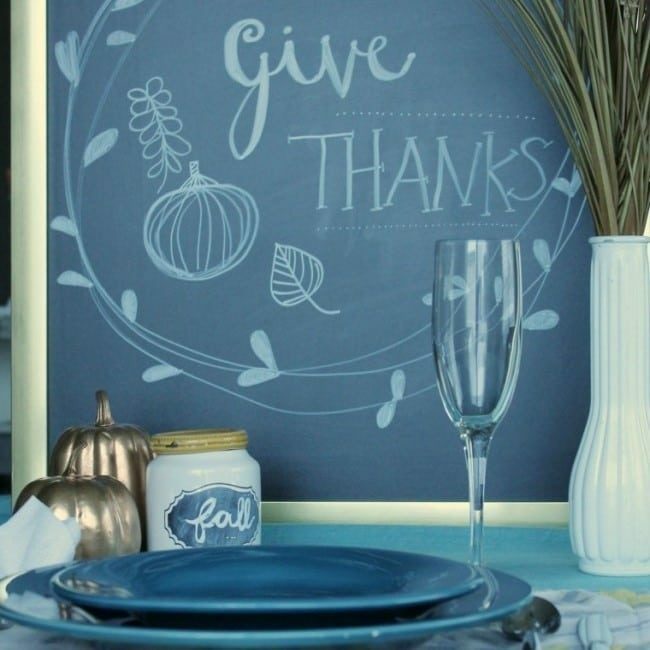 Thanksgiving can definitely be very stressful, especially if you’re the one hosting. We always have Thanksgiving at our house, so we make sure to keep the house very clean and make lots of great food. It certainly can be stressful. Thanksgiving is so stressful for me but ours was already done, so I don’t have to stress over it for another year! To remove the stress of thanksgiving I do as much ahead of time as possible. We also usually do thanksgiving with family so we all do a potluck sort of meal. So it really helps to spread out the food responsibilities. Ahh, Thanksgiving without stress is a wonderful thing. Thanks for these tips. I am a big fan of lists. This way nothing gets forgotten. Also, delegating is a great idea. The more tasks assigned out the better. We have already had our Thanksgiving in Canada but this list can also be great for Christmas as well. We take the week before Thanksgiving to prepare in small chunks. My father traditionally hosts the meal but I come over as early as 4am to start setting up and getting the food moving. I will have to use some of theses tips, it can get pretty stressful at my house at Thanksgiving. I agree with the cleaning while you cook, that would help so much. OHH mason jars for candles! I am going to do this! I can’t wait for the holidays I LOVE them! It is fun to do holiday stuff! Love all of your tips! I host, so I try to delegate as much as possible. I’ve got to give this stuff a try. I always try to use all-natural products whenever possible.